Posted by Joan Brasher on Thursday, January 17, 2019 in Peabody. 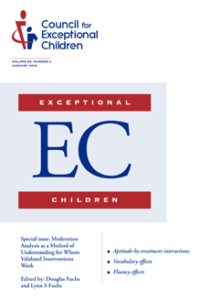 A Vanderbilt special education research team served as guest editors of the January issue of Exceptional Children, the distinguished research journal of the Council for Exceptional Children. 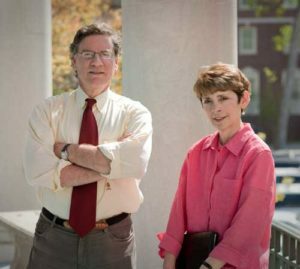 Douglas Fuchs, Nicholas Hobbs Professor of Special Education; and Lynn S. Fuchs, the Dunn Family Professor of Psychoeducational Assessment, co-edited the issue, choosing the theme of moderator analysis. The Fuchs asked five accomplished intervention researchers to join them in writing for the issue, and seven research papers are featured. Each team selected a previously published intervention study on which to conduct moderator analysis, examining whether at-risk students’ pretreatment performance in reading or mathematics interacts with the effects of intervention. An eighth and final article is authored by two respected quantitative psychologists at Vanderbilt, Kristopher Preacher and Sonya Sterba. Together they reflect on study findings and comment on methodological implications for guiding future work. Read the January issue of Exceptional Children.